Anyone who knows me knows I do not like to be negative or whiny or mopey or depressed or wallowing in self-pity but I have seen all of that in myself this year. To make matters (and my mood) worse, I kick myself for not immediately seeing the “bright side” or the “miracles” in a situation (or several situations, also known as 2018). Sometimes life is just a crapfest. Caregivers know this yet we get kind of stuck in a bad mental cycle. As one of 44 million caregivers, I know there are others with much worse situations than mine. That feeds into my mindset that I “should” be able to be more positive. Not to mention I am a positive person and get frustrated when I lose that piece of myself. Caregivers also know how difficult it is to continue to talk about everything going on. I get tripped up when people ask me if things are going better. No, not yet. They really aren’t. We have a lot going on and some of it is not better. I want to say things are better and HURRAY life is looking up but find myself apologizing for things not being better! Holy cow, sometimes things are not getting better; much of what we deal with are chronic conditions that are not going to get better. When things are really terrible or continue to not be better, co-workers and the cashier at the grocery store don’t want to hear that. Even some family tires of the near constant updates of hospital stays, non-healing wounds, seizure clusters, surgeries and whatever else might come up. Ongoing crap makes people uncomfortable. Sure, to the cashier and some co-workers I will say everything is fine (ha! Isn’t that the standard line for caregivers?) To friends and family, sometimes the best I can muster is “things are stable.” And that’s only if they are! That could be for the hour, the day or, if we’re lucky, for a week. Who wants to hear that? People want to hear that you are better! Life is on the upswing! We want roses, puppies, unicorns and rainbows! Believe me, that’s what I want to say. I really do want things to be excellent and happy and carefree! For caregivers (and I would venture to actually say “for anyone”) that isn’t always possible. Not all the time, anyway. It has taken me a lot of extra effort to be able to see that, yes, we have had many miracles in the midst of this challenging, difficult, crappy year. Our miracles? We have had plenty. Just this year, Robert has been in the hospital multiple times for the flu, pneumonia, sepsis, a respiratory virus and a five day video EEG study which turned into a week-long stay when his seizures caused aspiration pneumonitis. He could have succumbed to sepsis or gone into status epilepticus but Robert pulls out miracles all the time. This year has been no different. Richard has had two skin grafts and an intrathecal pump replacement, broken finger and expects to have another skin graft this summer. Richard’s initial skin graft was mostly successful and it is only the last 10% that we’re trying to get healed. His leg pain has diminished greatly and that, in itself, is a miracle. Carol has been hospitalized for pneumonia and a fall and has been teetering on the edge with extremely low blood pressure, a wildly varying pulse and water retention and an INR number that jumps around more than it should. She has lived with us since last November and having her around has been its own kind of miracle. 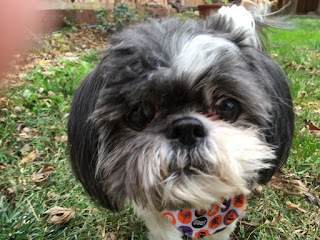 Even our nineteen year old Shih Tzu has had a couple of strokes and, at one point, didn’t appear to be able to last through the night. She has recovered and is back to her feisty ways. A miracle is the only way to describe that feat. I am convinced she still hates me but miracles can only go so far. Throw in my own emergency room visit and follow up appointments and scans for TIA-like symptoms and then getting side-swiped by a semi-truck and I have much to be grateful for. Adding an aspirin and cholesterol medication to my daily regimen has stopped the scary stroke symptoms and the whole semi-truck incident is nothing short of a miracle itself. Robert and I had no injuries and my car is still drivable. You would never guess from the damage that it was caused by a wayward truck driver. Volkswagen (and our angels) for the win! Despite finally being able to see and appreciate the miracles, my stress level is at maximum capacity. All these situations come with a lot of expense, more doctor appointments, more medications to track and take up a great deal of time. Call me a wimp but I am ready for a break. I know that for things to change, I need to make changes. That is not to say Robert’s seizures will stop or Richard’s leg will magically heal because those are things we do not have control over. What I can change is what I do for me so I can better handle the stress of this difficult year. Even the phrase “self-care” makes me cringe sometimes but I know that’s exactly what I need. Getting a pedicure with my daughter doesn’t stop Robert’s seizures or Richard’s pain or a truck from driving into my lane while I am still there but it does give me an hour to recharge, laugh and get some pretty toes and relaxed feet. Even seriously considering a schedule change at work becomes more of a priority for me in order to reduce my overload of stress. I cannot continue to beat myself up for trying to successfully work a difficult job and be a compassionate caregiver and feel like I am failing. When I am losing patience with actual nice people at work and at home, something needs to change. I cannot lose who I am because of the stress of a difficult year and being an impatient, cranky madwoman is not who I am. Change must happen because I am not going to lose myself to worry and stress. It might take a miracle for change to happen but sometimes we have to create our own miracles and that is my plan for the second half of this crappy year.